The base was painted red and black many years ago. The paint is faded and has a worn look to it. The feet are in good condition. It swivels and adjusts up and down fine. The seat is new. The seat was stained and clear coated. Height adjustable. Maximum height = 33 (Must be repaired for full height - currently stuck in lowest position). Minimum height = 26.75. Made in the USA by Gordon. This is right out of a very Old Dairy Farm Estate sale! Old green rubber seat cover. 15" from one foot to another. 24” tall by 11.5" dia. - chair is signed un-signed - appears to be its original Finish but very rusty - & finish loss - - the swivel step portion needs to be adjusted so it sits flat on ground . . You will receive exactly is what you see in the photos. York PA, probably in the 1940s. The white spots in the pictures are reflections of my photography lights. Size - 24"H x 16"L x 16"W. We have four of these stools that all match and are all in very similar condition. Heart shaped seat with low back. Lot of 2 Vintage Industrial Metal Shop Stools Swivel Seat - Height 22.5" to 30"
These Stools Are Very Sturdy - So, You Do Not Have to Worry About the Stools Tipping Over. Foot Print of Stools: 16" x 16". Counter Height Stools. Bar Height Stools. The Seat Height of these Stools can be Adjusted from 22.5" to 30.". Original 1940s era Toledo UHL Drafting Stool. Stool as it stands is 40 1/2" high to the top of the backrest, the seat is at about 27", but can adjust about 3" down. Stool stands firm; is not wobbly. Currently sits about 22" high. I did not try adjusting it. It shows amazing wear in all the right place from decade's of use. It is 4 bolts. DIRTY FROM STORAGE AND YEARS OF USE. HAS A MINIMUM HEIGHT OF 17.5" AND MAX HEIGHT OF 24" TALL. Solid and ready to Use. Swivel, Adjustable height screw. Gorgeous Stool in Great Rustic Condition. Solid and Firm. Words used such as Original, or reproduction, or the style of, or made by. And including a variety of reason. Los Angeles Area (Santa Ana, CA 92705). Has 15" round 3/4" thick very good wood seat. All original, nothing has been done, except a little soap and water cleaning, This stool has a fixed height and does not swivel. Wood seat and back are in good condition. All original, nothing has been done, except a little soap and water cleaning, This stool has an adjustable height but does not swivel. Wood seat and back are in good condition except 2 small little knicks in photos. Adjusts correctly from 16” to 24”. 360 Turn 14” x 16” wood seat has 3 places where Veneer is peeled or broken off. ( See pictures no. 10, 11, & 12 ). Back rest is very good. Great looking TOLEDO Industrial stool. The wood grain is fabulous! It does not swivel adjust, instead it has a unique adjustable plates that are manually adjusted with bolts under the seat. I show this in the last photo. It’s very sturdy, no wobble, and the casters are in top notch condition. Wood is very good - NO PEELED VENEER. Has nicks and scratches associated with normal use. Seat wood has a worn finish. Back rest adjusts aprox. Does not turn 360. Has TOLEDO MFG. sticker under seat. .. You will receive exactly is what you see in the photos. Backrest is adjustable in two places. 41" overall. It features a wooden seat and is adustable in height. It has the original marking underneath identifying the manufacturer. A heavy and quality industrial style piece! Adjusts correctly 16” to 24”. Wood seating is nice - NO issues ( dark line on 14” x 16” seat bottom is grain mark NOT bad spot ). ONE OF THE MIDDLE BRACKETS IS BENT. STURDY AND READY TO USE. Have 15" round wood seats, with wood back rests, that are 1" thick, and 23" off the floor. Back heights are 37". Stools have a great worn paint finish, with the nicks and scratches you will see from normal use. TWO WHEELS ARE WOOD AND THE OTHER ARE HARD RUBBER AS SHOWN. WHEELS TURN AND SEAT RAISES FROM 14" TALL TO 19.5" TALL. Adjustable drafting machinist stool. Stool has a gold velour seat cover. New owner can clean the cover or replace. Works well nice condition. Seat cover has stains from previous owner's. be much higher with a much bigger box. Nice solid wooden seat, it is not cracked it is actually 2 pieces of wood for the seat, very solid. Steel legs that are also solid. Very cute and useful, will tuck away in the corner of a room easily. Adjustable swivel 15" solid round hardwood seat;. 22" - 26-1/2" adjustable height; Seat wood is in great original condition - just a scrape (not a scratch) on. 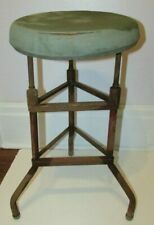 Vintage 30” tall wood / green metal industrial stool. Wood seat is 14” round and 1” thick, it is in nice condition. Green metal has some finish nicks & scratches from LESS than normal wear - it is structurally excellent. Great looking tall industrial stool !!!! Antique Vintage Steampunk Shampaine Co St.Louis Industrial Swivel Drafting Stool. Adjust fine needs lubrication for squeak. average 18" / 24" height. Many uses.Vintage condition.Might get a little more height stopped with riser at bottom of channel. It stands 24-1/4" tall and the base is 6-3/4" x 6-3/4". It does have dings and minor rust stains but not bad, just enough to give it "The Look". Great condition. Classic form. Swivel adjusts from 15” to about 20”. It is a nice strong, sturdy stool in a fabulous color. It is a wonderful reddish orange color and it still retains a good part of its original decal on the seat back. repurpose-chances are it won't be used in its original form, the possibilities of use are only limited by your imagination.